Unfortunately, in a cold-weather state there’s certainly not much pleasure and enjoyment in having a backyard pool in the winter months. It’s hard to really put a spin on how much you enjoy hunkering down in the house, when you really are hankering for a nice swim in your beautiful backyard pool. You can usually hold up all the fingers on one hand, and maybe a couple on the other hand, for those months your pool is dormant and covered up … just a big dark square in the middle of a white canvas of snow. About all the TLC you can give your backyard pool in the dead of winter is occasionally checking to ensure that the cover, which you so carefully weighted down in the fall, has not been moved out of place due to drifting snow or bored wildlife in the backyard. During the course of the winter, every so often it is good to be proactive and check your pool to ensure nothing is amiss and the cover is still flat. Otherwise, debris will gather in the pool and make you one very large cleaning job, come spring, when you are most anxious to christen the pool for another season of use. As long as you followed the steps for properly preparing your pool for dormancy as recommended by your pool manufacturer, you should be able to while away the winter sitting catching up on all the best sellers. To refresh your memory, the proper steps for closing and winterizing your backyard pool deal primarily with removing all debris from the water, ensuring all water is blown out of all the equipment and pipes, and the proper combination of winterization chemicals are added to keep the bacteria at bay. After all these steps are followed, the most-crucial of the putting-the-pool-to-bed-process is adding the protective cover to the pool to keep unwanted debris from blowing in and settling to the bottom of the pool during the course of the Winter or early Spring. Not only will the debris create an added chore for you, but it will stain the liner if it is not removed as soon as possible. Rubber plugs – Your pool probably came with extra rubber plugs for each of the return valves and skimmers. Check each one to ensure it is not damaged in any way; if so, order new ones immediately. Winter chemical kit – Buy this kit at any pool supply store or online (it is sometimes cheaper to do the latter). Winter cover and leaf net – Carefully measure the length and width of your pool to determine the proper size cover and leaf net needed. Unpack it immediately after purchase or receipt of same to ensure it is the correct size (sometimes they are inaccurately packaged) and check for any rips, tears or holes, that might have occurred during shipping and handling. One set of water tubes – Based on your pool’s dimensions, you can easily calculate the amount of water tubes needed to completely encircle your pool. One or two days prior to closing your pool, run the filter for approximately 24 to 48 hours and lower the water level per your pool manufacturer’s directions. On the day you close the pool, recruit a significant other, friend or neighbor to help you place the pool cover properly over the pool. It is difficult to do this step yourself. Turn off any power which supports the pool, as well as remove fuses or circuit breakers where appropriate. Remove all floats or toys from the pool. Remove all pool accoutrements like ladders, diving boards or railings to allow the pool cover to sit on top properly. Remove all debris from any equipment such as the skimmer or pump basket. Skim your entire pool before placing the cover on, to avoid any remaining debris that will settle down to the floor of the pool, causing stains, or creating unnecessary sediment which will be difficult or tedious to remove when you open the pool in the Spring. Administer the chemicals necessary to winterize the pool during the next 5-6 months. Fill a bucket three-quarters full with water, then add the shock ingredients to the water, all the while encircling the pool and equally distributing the mixture into the pool. As a general rule, for every 10,000 gallons of water, you will need one pound of pool shock. Installing the cover and leaf net. Once the pool chemicals have been properly administered, it’s now time to install the cover. As stated above, it is recommended that you have at least two persons perform the cover installation. 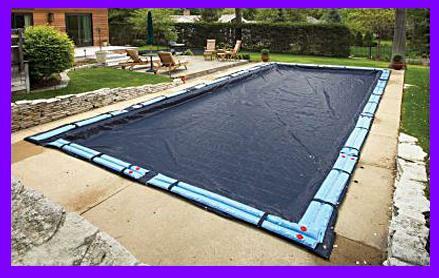 Remove any ladders or pool accessories away to get a good fit of the cover on the pool surface. Lay out the length of the cover and with your helper on the opposite side, grip the cover’s edge and walk it over the surface of the pool. Avoid allowing any water to sit on top of the cover as water might weigh down the cover and cause it to sink to the bottom of the pool. When you are satisfied the cover is completely flat, secure it with a set of water tubes to hold it in place. Next, fit each empty water tube through each loop of the cover, and then submerge it to fill the tubes with water, thus weighting down the cover to keep it securely in place. Once the cover is firmly in place, it is time to install the leaf net. Ensure the leaf net completely covers the pool cover and there are no gaps. Place the two covers together underneath the water tubes so nothing, like a strong wind, will move it, and then move the leaf net. The leaf net is really only a temporary measure if you have much large trees in the neighborhood. The leaf net will catch the leaves so they do not fall onto your pool cover and sit there all winter and rot the material or cause the cover to deteriorate or pull away from the sides of the pool. Once all the leaves have fallen, simply gather the leaf net and its leaves, empty it out and store it until next fall. Walk around the perimeter of the pool to ensure each water tube is securely holding down both the cover and net so that your pool will endure and be debris-free come spring. If this is the first time you have to close your new pool for the season, just take a deep breath, re-read the manufacturer’s instructions, and if you’re unsure of what you are doing, contact Shoreline Pools in Stamford, Connecticut and they will send a contractor out to assist you in properly closing up the pool for the winter.